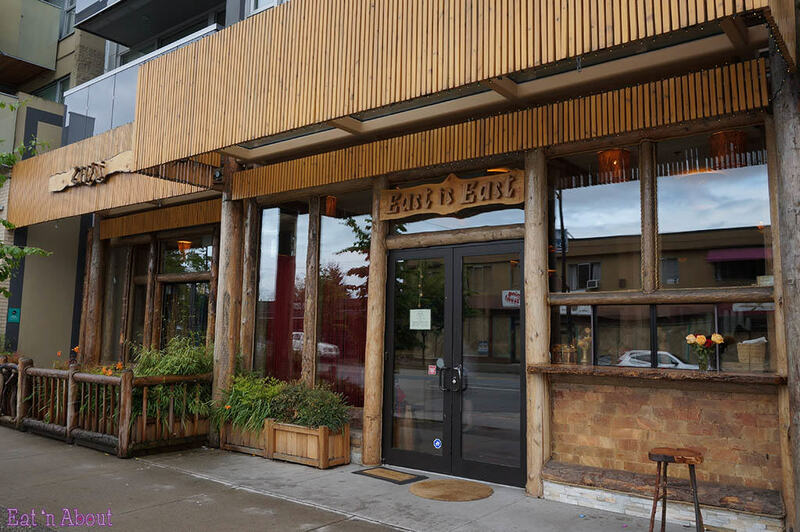 East is East has two locations, one on Main St. and one on Broadway in Kits. 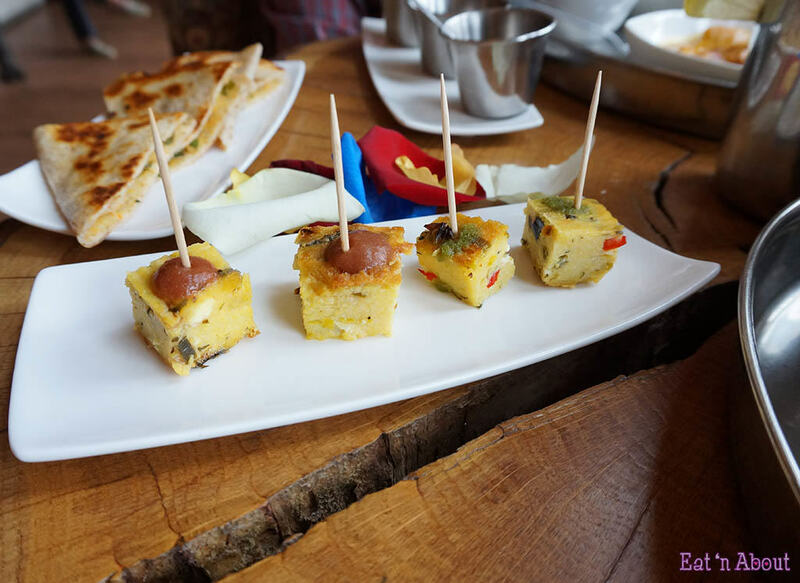 After sampling some of the Kitsilano East is East offerings at a recent YVR Foodies Meetup, we won a gift certificate for being really spammy on Twitter that day hehe. 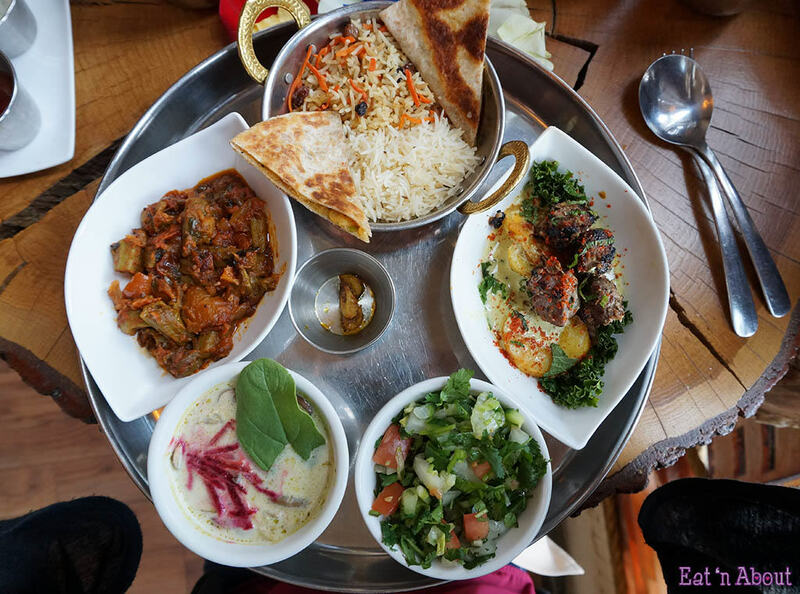 The certificate could be used at either location, so we headed to Main Street to try East is East’s oft-gushed-about Silk Route Feast (called Chai Feast at dinner, more on that later). Everything we tried at the Kits location was super-awesome too by the way! You may notice two similar-looking storefronts on the same block of Main St. East is East used to have a smaller location up the block, and when they moved to their new digs a couple of years ago they decided to keep the old space for their main kitchen. Business must be good! Upon entering we were greeted by a relaxed, laid back, and new-age atmosphere replete with Dalai Lama quotes and symbols of various faiths adorning the walls. The servers were very friendly right off the bat and were quite attentive throughout the meal. We noted on the way out later that once it got busy East is East provided food and drink samples for those waiting for tables. 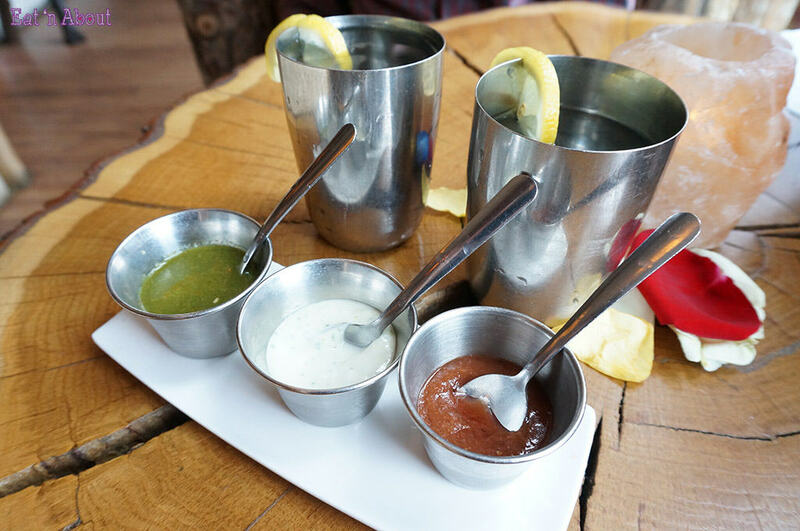 They also provided us with samples before we could even order! This was to be a most welcome theme throughout our evening at East is East. Here we have their Soy Chai, which was spicier than I’d had before. 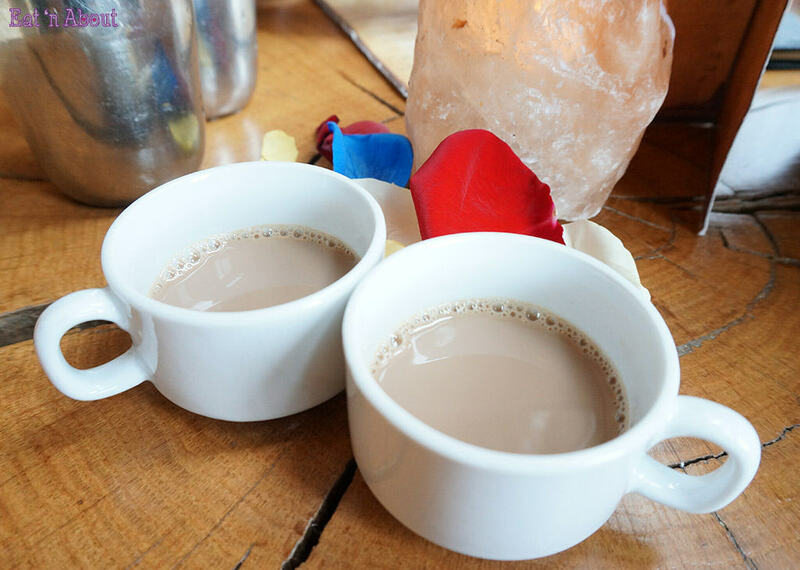 I haven’t drank a lot of chai, but this was the best I’ve tried so far. The tables and much of the restaurant’s furnishings and decor were made from reclaimed wood, handcrafted by a local artisan. Our table came beautified with a smattering of brightly coloured flower petals and a Himalayan salt candle. The walls at East is East are made from Himalayan salt, too! Afghan rice – Cooked with carrots, raisins, and whole cumin seeds. Basmati rice – Cooked with cumin seeds. Pickled garlic – An achar, this was more palatable than others we’ve tried. Boulani – An Afghani dish, whole wheat pitas filled with a savoury potato mixture. Quinoa Tabouli salad – Fresh, with LOTS of parsley. Too much for me; see my comment in the next section. Sambar Squash soup – Made from yellow dhal soup base. Creamy and mild, pleasant. Seasonal Fish Curry – A South Indian curry, this one was deceivingly mild. 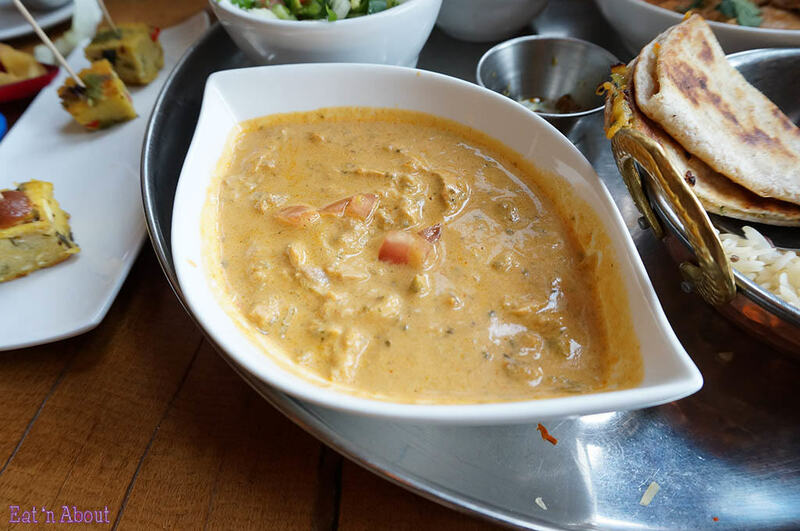 Tread cautiously though; the coconut curry creeps up on you! Lovely. Minced Beef Curry – A bit spicy, tomatoey, topped with raita. This one reminded me a bit of moussaka filling. Delicious, but a tad bit salty. Persian salad – Cucumber, tomato, onion, lettuce, mint, and cilantro. Everything was very fresh. Wendy exclaimed, “I’m in cilantro heaven!” My response, munching on a mouthful of tabouli, “I’m in parsley hell.” Clear winner on the salad front here. Mystic soup – Excellent tom ka style soup with enoki, oyster, and button mushrooms in a lemongrass, ginger, and coconut curried broth. While both soups were good, this was the better of the two. Baby Okra – The sauce on this one tasted similar to the beef. The extra salt was a bit more bothersome in this dish. Lamb Curry – Yogurt cardamom curry came with potatoes and kale. The kale was especially handy for mopping up the last drops of the curry. We both loved the lamb. Wendy and I both go gaga over freebies, so we were delighted when our waitress brought us some gratis Polenta Squares in between platter refills. I should mention here that this was not special treatment or anything, everybody was getting little samples throughout the evening. This seemed to be standard procedure at East is East. Back to the polenta, it had lots of baked in veggies. Good stuff. We were both pleased with the relatively short wait time between courses as well. However, we’ve read that when East is East is busy the waits can be a bit longer, so if you notice the restaurant’s packed you may want to place your refill order before your first servings are finished. I’ll break down the last few dishes one by one. The Wild Salmon was miso-baked and came in a red/green curry with lime leaves and fresh tomato. Wendy didn’t care for the salmon, finding it a bit over-cooked (she leans towards a kind of medium-rare when eating fish I’ve noticed). For me though, this was one of the star dishes of the night. 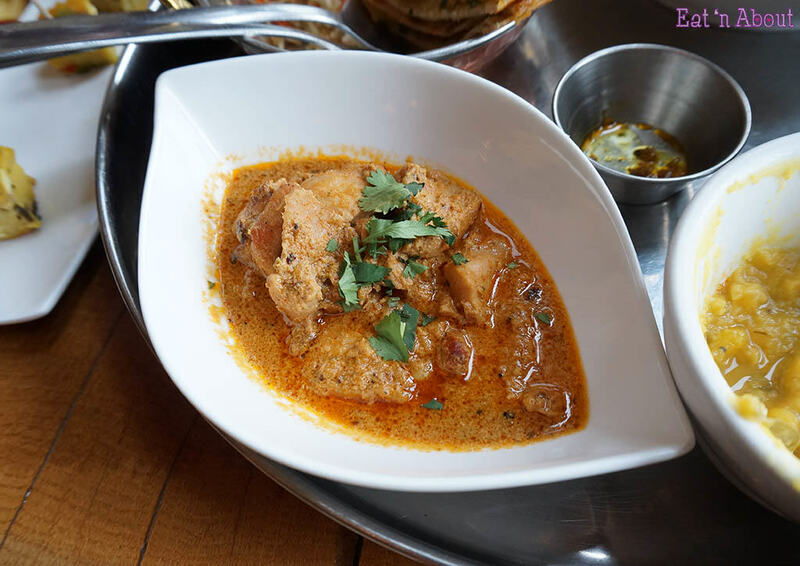 I loved the fact that it was absolutely swimming in its curry, and I happily lapped the liquid up by the spoonful. Medium spice level. The Spinach Paneer was the only real let down of the night. Forget the tabouli bit because that’s just a matter of preference on my part. 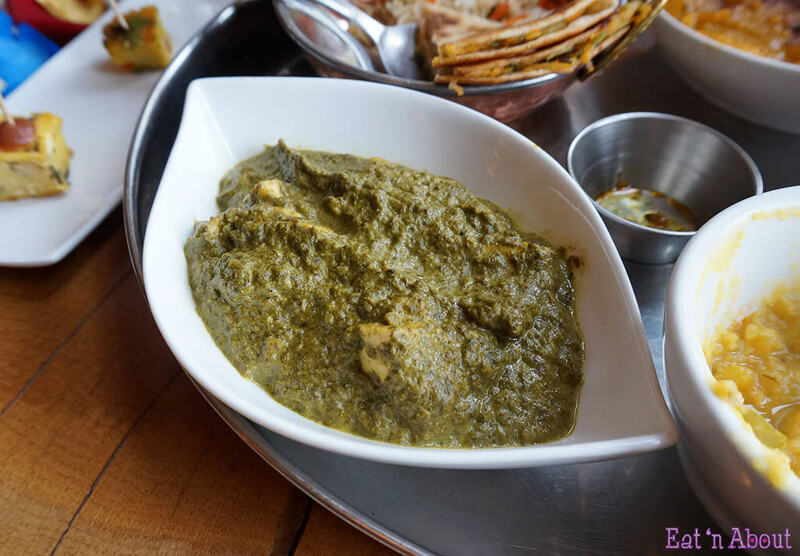 Palak paneer is one dish that I know well and am quite fond of though, and I can honestly say this was the worst I’ve had, apart from some Wal-Mart prepackaged one where the paneer was a dark brown colour. Actually East is East’s version was worse than many of the store-bought packages. Very bitter and not enough spices coming through in the sauce. They also offer vegan paneer if you dare. Wendy’s favourite was the Chicken Masala. But again, we didn’t see eye-to-eye. She loved the nice soft chunks of moist chicken and the creamy sauce, I found it a bit boring. I think that’s only in light of all the other highlights of the evening though; I feel like I was a bit spoiled by all the exotic and powerful flavours that night. Looking back, I think it’s safe to say that the Chicken Masala is a solid effort. 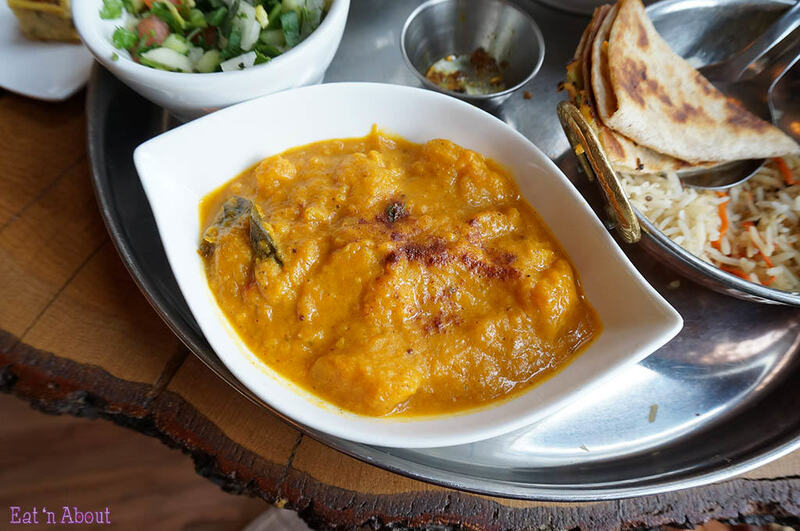 If you order the Mango Butternut Squash as part of your Chai or Silk Route Feast, I would advise saving it for the last round since it’s a nice segue to dessert. Consisting of mango puree and chunks of butternut squash, it’s cooked with coconut milk, ginger, nutmeg, and cinnamon, and curry leaves. All the aforementioned ingredients are easily detectable in this sweet and spicy combo. The Mango Butternut Squash goes well with a meat dish alongside it. Just when we thought we had come to the end of our Silk Route journey at East is East, even more free food arrived in the form of some complimentary dessert samples. The Vegan Chocolate Pudding was headily rich, but the raspberry sauce tempered the richness perfectly. Two blueberries acted as garnish for this little dollop of heaven. 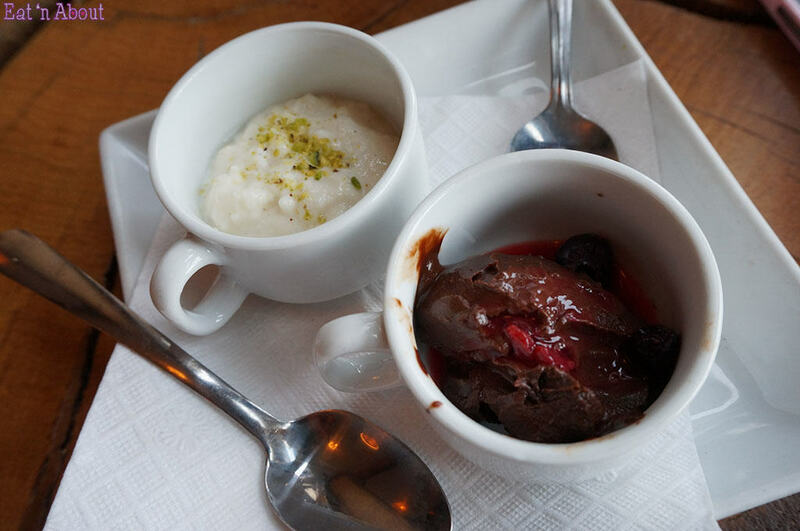 On the left, the Cardamom Rice Pudding was quite refreshing with a clear taste of cardamom and rosewater. I would recommend either, depending on whether you’re in the mood for a light or heavy end to your meal. East is East also plays host to live musicians most nights of the week at its Chai Lounge. East is East Main St. and the Chai Lounge are one and the same; they just change the name to Chai Lounge at night to go with the change of atmosphere. 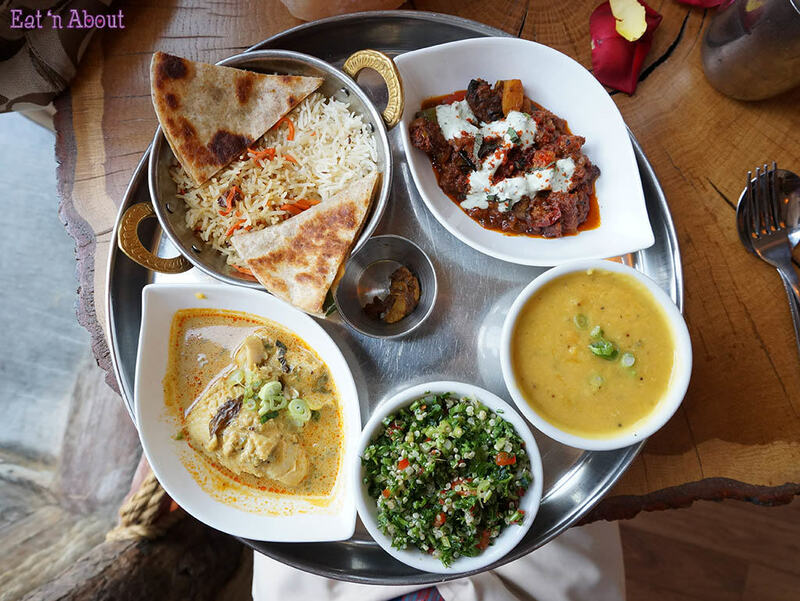 The Silk Route Feast ($21) also changes to the Chai Feast ($27) with a slight change of menu items. The Silk Route Feast runs from 11:30 AM-4:30 PM and the Chai Feast runs from 5:30 PM to closing. We managed to arrive within that hour window period, and even though they still served the Feast it came at Chai Feast price. I’m not clear on the menu though, Wendy says it definitely said Chai Feast on it, but the dishes were slightly different than East is East’s Chai Feast menu on their website. Whatever we got, we liked it and felt we got our money’s worth. On the Sunday night we were there the Gypsy Jazz Band had just started to play at 7:30 PM. 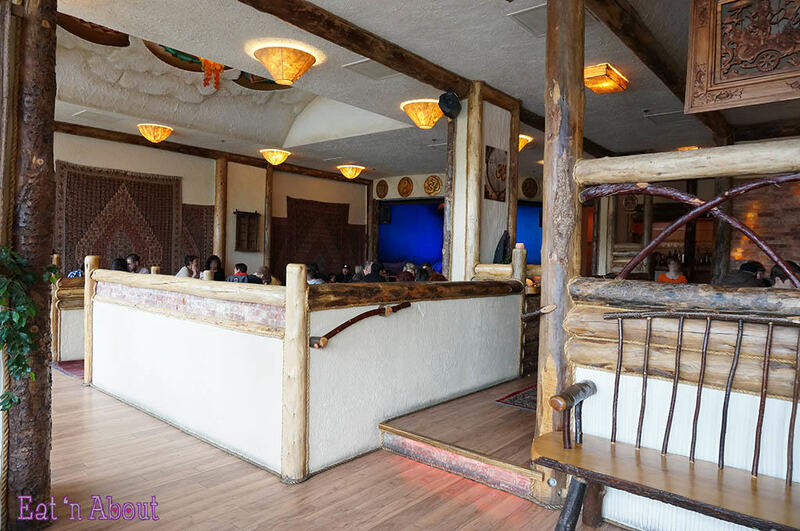 You can catch a taste of Chai Lounge’s atmosphere in the video above. And with that, it was time to head back West, but we won’t soon forget our trip down the Silk Route at East is East and the sights, sounds, smells, and tastes we experienced there.